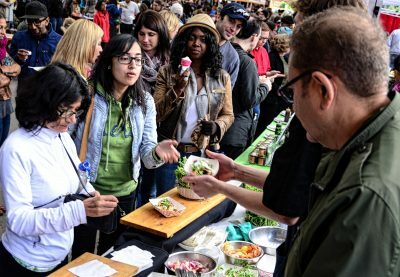 The Toronto Garlic Festival is the annual celebration of Ontario’s garlic harvest where Ontario farmers sell garlic and local chefs cook with garlic. The festival features Ontario farmers and chefs, small scale rural and urban food producers, and craft and alcoholic beverage producers. 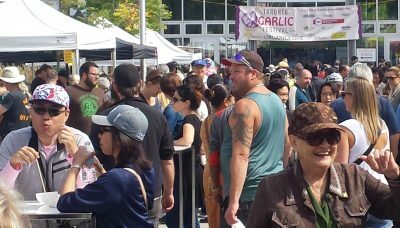 Festival visitors stock up on their winter supply of fresh garlic and taste delicious garlic-themed food and black garlic beer. They buy garlic-themed products while listening to live music, enjoy festival screenings, participate in educational talks, get a free garlic shot from a garlic barista, enjoy grilled garlic scapes, have their breath measured in the parts-per-billion in the garlic breath contest, attend art workshops and cooking demos and; donning VR goggles, participate in a virtual reality Ontario farm tour. The festival works with farmers, chefs, chocolatiers, small-scale food producers, craft breweries and wineries to develop and promote Ontario garlic-themed products. The festival encourages small-scale farmers and food producer to attend as vendors. Founded in 2011, and incorporated as a not-for-profit in 2017, the Festival operates on a triple bottom line: People, Planet, Profit. All revenue is applied to operating costs including venue rental, public relations and marketing. Except for paid staff on the day of the festival the festival is a volunteer run event. Farmers – At the festival visitors learn about the many strains of local garlic from 20+ Ontario farmers who grow and sell rare and heirloom varieties of hardneck garlic including Porcelain, Purple Stripe, Rocambole and more. 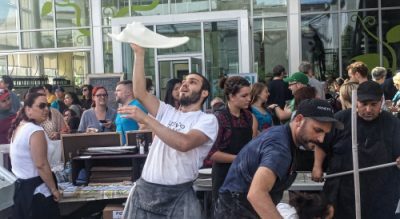 Chefs – Many mouth-watering savoury dishes have been featured at the Toronto Garlic Festival, including Seared Halibut with Roasted Parsnips and Garlic Puree (Kukum Indigenous Kitchen), Fries with Garlic Aioli & Toasted Garlic Chips (Jamie Kennedy Kitchens), Garlic Sliders (Chef Brad Long),Vegan Smoked Salmon Lox with Lemon Roasted Garlic Hummus & Dill (Vegiterra), Roast Suckling Pig with 50 Garlic Bubs (Chef Ron Raymer), Organic Kale & Garlic Crusted Popcorn Drizzled with Chili Maple Caramel & Himalayas Pink Salt (The Spice Chef), and Karaage Chicken (Gushi Toronto) and many more. 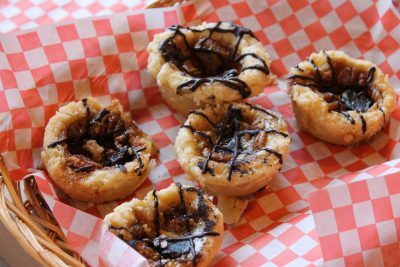 Garlic and Desserts – The secret to using garlic in desserts is featured in ingeniously delicious creations made especially for the festival by local pastry chefs and chocolateers. These have included Garlic Chocolate Brownies (chef Anne Sorrenti), Garlic Almond Brittle, Donuts in Black Garlic and Caramel Sauce (Globe Bistro), Garlic and Butter Popcorn Ice Cream, Dark Chocolate and Roast Garlic Ice Cream (chocolateer Tim English), and Black Garlic infused Salted Caramel Truffles (Chocolate Artist Laura Slack). Garlic Products – Also available for purchase are black (fermented) garlic, pickled garlic scapes, garlic jelly, garlic dill pickles, garlic soda, garlic braids, garlic bulbils (for planting), garlic pesto, and several types of Ontario-made condiments. 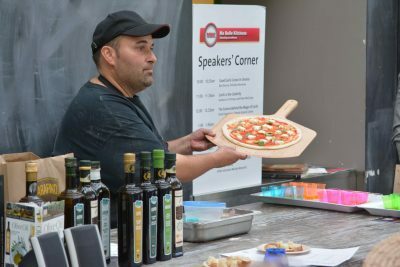 Speaker’s Corner – Features workshops, cooking demos and fascinating presentations on garlic history, health benefits and cultural secrets. Past talks include: Chemistry of Garlic, Food Scientist Irwin Adam and Chef/Comedian Ben Miner; Food Labels 101, Karina Kwong, Toronto Public Health; From Tianshen to Toronto: The History of Garlic, Professor Robert Litke, Wilfred Laurier University; Garlic is as Good as Gold: Currency, Flu Fighter, Tastemaker, David Sugarman, Ontario Science Centre; Garlic and Olfaction, Professor Eric Block, Albany State University; Living a Low Impact Life, Andrew Knox, President, Transition Toronto; Growing Garlic in the City, Bart Brusse, Sheridan Nurseries, and; Why Vampires Hate Garlic, Dr Elizabeth Miller. Films – Every year the festival features thought-provoking and entertaining films, free with admission. 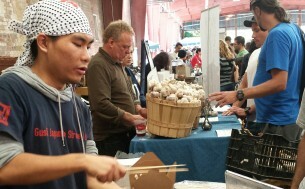 Year round – The festival promotes Ontario garlic year-round through garlic donations to fundraisers and appearances at food events and fundraisers. Every fall the Toronto Garlic Festival gives away hundreds of garlic bulbs, including many rare and heirloom varieties, to community gardeners. Admission – $5.00. Free for children under 12. Price includes free free access to talks, presentations, film screenings and activities, including The Garlic Breath Contest, The Garlic Shot Station and food cooking demos. Fresh Ontario Garlic, delicious food and craft beer and wine are for sale. The festival is covered extensively in print, radio, TV and social media. The festival was started in 2011 by garlic grower Peter McClusky. His book, Ontario Garlic: The Story from Farm to Festival, (History Press, 2015) is in book stores and is available online and in local (Ontario) libraries. His blog is at Peter On The Farm. Artscape Wychwood Barns, 601 Christie Street (at St. Clair Ave West), Toronto. Ontario. M6G 4C7. Easy access by public transit, car, bike and by foot. Wheelchair accessible.